Your vision can have an impact on every part of your daily life. If your eyes aren’t functioning properly, it can affect you physically, emotionally and mentally. 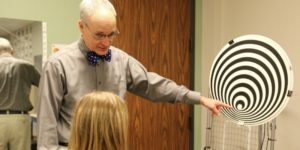 Typical optometrists prescribe glasses or contacts, but Dr. John Metzger at Kansas City Vision Performance Center in Building 22 has a unique approach. For 35 years, Metzger owned an optometry practice in Hiawatha, KS. Ten years ago, his daughter convinced him and his wife to start a new practice in Kansas City to be closer to her family. Read the full article on the Corporate Woods Blog.